I’m thrilled to reveal the project I’ve been busily developing in secrecy for the past couple years! 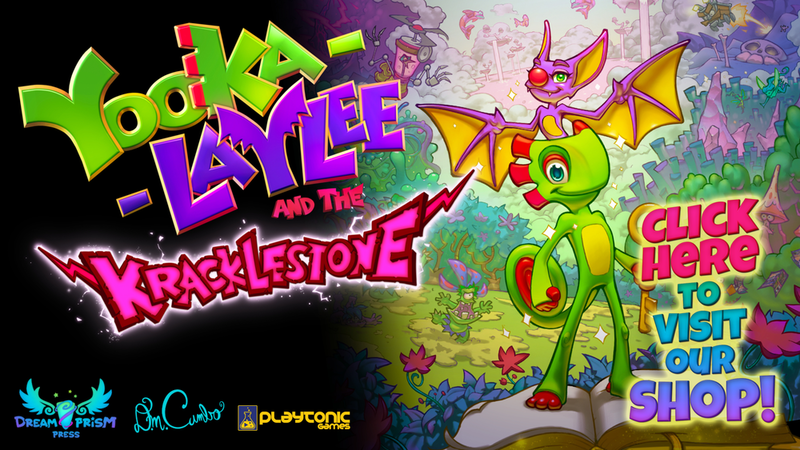 Yooka-Laylee and the Kracklestone is a 120-page graphic novel based on the world and characters of the Yooka-Laylee video game by Playtonic Games. I’m even more excited to reveal I’m launching a Kickstarter campaign offering the book to interested Playtonic Games and Dreamprism fans TOMORROW, Wednesday October 17th! It’ll be a 30-day campaign during which you’ll be able to secure a seriously awesome copy of Yooka-Laylee and the Kracklestone in a gorgeous heirloom-quality volume. And, hey… this’ll be the first Dreamprism book to make it to print, so no time like the present to start that collection! Obviously, there’s a LOT of info to share. This is a seriously epic story that I’ve poured my heart, soul, and energy into making. There’s too much to fit in a single blog post, so I’ll gradually reveal more over the course of the next month during the campaign. In general, the best way to learn about the project is to visit the Kickstarter page which will go live tomorrow! First, IGN.com has published an exclusive story about the project so why not pay them a visit! Visit the Yooka-Laylee page in the Our Books section for story details and to preview some pages from the book! Make sure you’re subscribed to the blog and following us on our social media pages including Twitter, Facebook, and Instagram. In general, quick moment to moment news will be revealed on social media with the big stories being posted here on the blog. SO… the most important detail to note is the campaign will launch tomorrow at 11:30am PST/2:30pm EST/. Kickstarters tend to thrive on early support so please pledge early and help this book become a reality! Throughout the course of the campaign, expect a lot of updates, social media posts, YouTube videos, interviews with cool industry folks, previews of work-in-progress on the book, and more.